The Slate Gray 1970 Porsche 911T that appeared in Le Mans and was owned by the movie's iconic star will go up for auction in August. 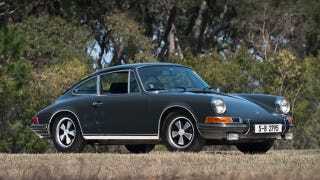 Steve McQueen used the car for personal transportation during the filming of the movie in France and had the Porsche shipped back to the United States after filming. Shortly after McQueen brought the car back to the US he sold it, preferring the 1969 911S he already owned to the 911T. Even so we imagine the combination of the car's Le Mans appearance and McQueen's ownership will add quite a premium to the price of the 911T when the car crosses the block in Monterey, Ca this summer.